Those who have great aesthetic sense, generally tilt towards transparent or glass colour. Glass is extensively used now in the interior decoration, furniture, statues, dolls, utensils etc. Transparent colour gives a soothing effect on your soul and it's my fondest colour. Have you ever thought of making a house with a glass ? Perhaps a strange idea, at least in India where you have huge security issues. Even with brick and mortar houses, thefts are an endless saga here. I am yet to recover from the shock of theft occurred in my block last week where the thieves stealthily took away valuable items from a neighbour's house, in the broad daylight. In fact, living is an idea and all can't comprehend. It is an assortment of comfort, venture and aesthetics. Japanese are known as warm-hearted people with high dose of patriotism . They are technologically advanced with the extensive use of robotics in daily life. When a man reaches comfortable level in personal finances, quality becomes the buzzword in every act. 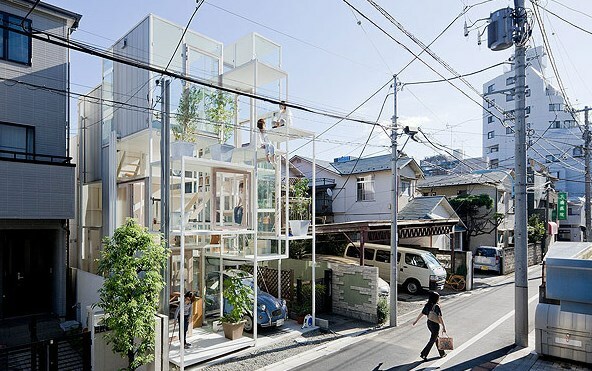 So, it is not wild idea when a young couple in Tokyo wanted to build a glass house in 914 square-foot area. The moment, they got the idea, it was executed by Sou Fujimoto Architects who say that their clients desire to live as nomads within their own home. Now the glass house owner perhaps enjoy Mother Nature nearer than others, but privacy is a huge concern ! But only the rich can afford to buy this idea ! This is quite an interesting concept! Though as you mentioned in India this seems to be out of question. Appears to be quite a new concept in Construction Technology.. Loved the Post,Srinivas!